Our riggers are trained to safely move your industrial machinery from one facility to another, or within the same building. Consult with Interstate Rigging for more information on our machinery transport and installation services. 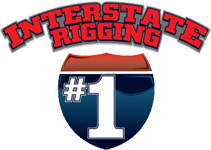 Interstate Rigging in Newton, New Hampshire, is dedicated to handling all of your moving equipment needs. Our riggers can handle the smallest machine to the largest products. We started our company more than 20 years ago moving machinery using a small truck. Since then, we have expanded to serve Massachusetts, Maine, Rhode Island, New Hampshire, and Connecticut. We provide industrial machinery moving services to small and midsized companies and corporations. For Interstate Rigging, there is no job too big or too small. We are dedicated to paying attention to details and taking care of all of your machinery and equipment moving needs. "I ran across Ed Wallace and Interstate Rigging about 10 years ago, when Ed and Dave came to pick up some used machinery that I had sold to one of their clients. I was impressed with their professionalism, the condition of their equipment, and the efficiency with which they accomplished their mission. Having experiences with several rigging companies in the past who were lacking in at least one of those three categories, I asked for a business card. Since then, Interstate has delivered at least 10 machines to my facility, pulled that many out, and probably relocated 30 machines within the factory, many more than once. The most important thing for me during any machine move is to minimize disruption to production activities, and Interstate absolutely excels at this; they show up when they're supposed to show up, do what they're supposed to do with zero drama and zero fuss, and they're gone. That may sound simple, but most likely, if you are reading this, you know that it isn't. I have enough stress handling day-to-day operations without adding more worry whenever we are taking delivery of a new machine or relocating one of ours; with Interstate on the job, I don't even think about the actual move, just all of the pieces that take place around it. For me, it doesn't get any better than that."